Miami University anthropologist Jeb Card, along with Marc Zender of Tulane University, deciphered hieroglyphics to unveil evidence that redefines ancient Maya borders. 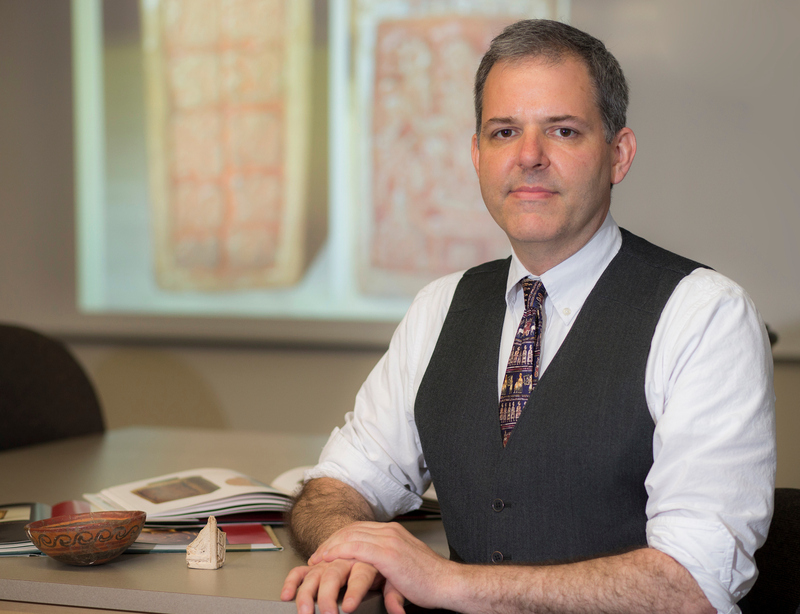 Miami University anthropologist Jeb Card helped unlock a key to ancient Maya politics and political boundaries with a seventh-century flask found in Tazumal, El Salvador. Card noticed the flask among other artifacts on a 2014 trip to the the Museo Nacional de Antropologia David J. Guzmán, in San Salvador. As a flask, it is like others associated with the Late Classic southeast Maya region near the city of Copán. It measures approximately 5 inches tall, 2.5 inches wide, and 2 inches long. Commonly known as “poison bottles,” experts believe flasks like this one were used to contain tobacco. What set this particular flask apart from the rest was that along with ancient art depictions, it also included a message. Card, schooled in hieroglyphics, noticed that the markings on the sides of the flask were not decorations, but instead, words with political meaning. Dating to probably the latter half of the seventh century, the flask was discovered in a burial in El Salvador’s largest pyramid in 1952 by archaeologist Stanley Boggs. The Maya hieroglyphic writing system had not been deciphered in 1952, so the full significance of the vessel was not understood, Card said. “This is the first meaningful Maya hieroglyphic record in El Salvador found in its original site on the southern edge of the Maya region. It suggests that western El Salvador was in a political relationship with the major Maya city of Copán, Honduras,” Card said. Card and Marc Zender of Tulane University deciphered the text to find that the translation tells how the vessel was dedicated to the 12th king of the Copán dynasty, K’ahk’ Uti Witz K’awiil — his name inscribed on the flask. This king came to the throne in 628 A.D. but around the middle of the century began dramatic expansion outside of the Copán Valley, concluding with his death in 695 A.D. Card explained. The flask appears to be a gift, possibly to a ruler or noble at Tazumal, as a symbol of political patronage on the part of the Copán king. As the Copán dynasty expanded geographically, the king may have gifted items to foreign rulers to ease the transition of power. The foreign rulers could keep their jobs and govern but were now paying homage to the Copán dynasty. “The flask is the first of this kind of vessel to name a Maya king known from other records, is the first historical record in El Salvador, and is the southern-most Maya text found (in its original site) and changes how we understand the boundaries of the Maya world,” Card said. This flask is significant evidence that tells the story of the Copán dynasty’s expansion into what is now El Salvador. Card suggests the Copán dynasty pushed southward to gain access to more territory with rich natural resources, such as jade. Their findings were published in the journal, Ancient Mesoamarica, vol. 27 (2016). By Carole Johnson, Assistant Director, Miami University News and Communications. Originally appeared as a “Top Story” on Miami University’s News and Events website. Photo of Tazumal archaeological site by Mario Roberto Durán Ortiz via Wikimedia Commons, used under Creative Commons license. Photo of Jeb Card by Jeff Sabo, Miami University Photo Services. This entry was posted in Research stories and tagged anthropology, Maya region. Bookmark the permalink.